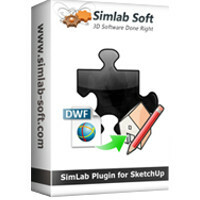 Import DWF files into SketchUp, where they can be edited. DWF is a secure file format developed by Autodesk for the efficient distribution and communication of rich design data. DWF files are highly compressed, they are smaller and faster to transmit than design files, without the overhead associated with complex CAD drawings. The plugin is supported on SketchUp 2013, and SketchUp 8.